Correct your Skin Conditions with Medical Dermatology Care at OC Skin Lab! Medical dermatology is the cornerstone of OC SkinLab. Our ultimate goal is to provide patients in the Southern Orange County (San Juan Capistrano, Dana Point, San Clemente and Laguna Niguel) area of California with expert dermatology and dermatopathology care in a warm, patient-centered environment. Dr. Michelle Hure has helped countless patients obtain healthy, beautiful looking skin — why not let her help you, too? Contact OC SkinLab today to take the first step towards your best skin. We look forward to hearing from you! 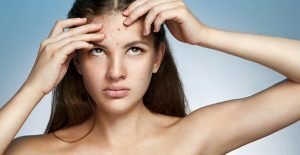 Acne is the most common skin condition, affecting nearly 85% of people in the United States at one point in their lives. People of all ages have the potential to develop this skin condition, and no two cases of acne are the same. Because each case of acne is so different, each treatment must be carefully tailored to meet the patient’s specific needs. Our acne treatments can range from topical creams, medicated washes and oral medications to in-office treatments like DermaSweep, chemical peels, micro-needling, and manual extractions. Skin cancer is the most common cancer, with over five million cases diagnosed every year. It is also the most easily preventable and treatable of all cancers if the proper precautions are taken early on. At OC SkinLab, we are committed to helping our patients prevent the development of skin cancer by encouraging them to maintain a regular skin care routine, use a daily sunscreen, and undergo professional skin checks. If we do find that a patient has skin cancer, Dr. Hure can perform a variety of effective techniques to remove the skin cancer completely and prevent it from recurring. Clinically referred to as “alopecia,” hair loss affects millions of men and women in the United States. Dr. Hure studied under an alopecia expert while a resident and fellow at the University of Massachusetts, putting her in a uniquely skilled position to both diagnose the causes of hair loss and administer their treatment. These treatments typically consist of topical therapy, intralesional injections, or oral medication. Think you or a loved one could benefit from any of OC SkinLab’s medical dermatology services? No one should have to live with unhealthy, uncomfortable skin. Contact us today to schedule an appointment.